Summary: The purpose of this project is to design and distribute static cling decals and posters to multi-unit residential and commercial properties along the beaches of Lido, Siesta and Casey Key in Sarasota County. 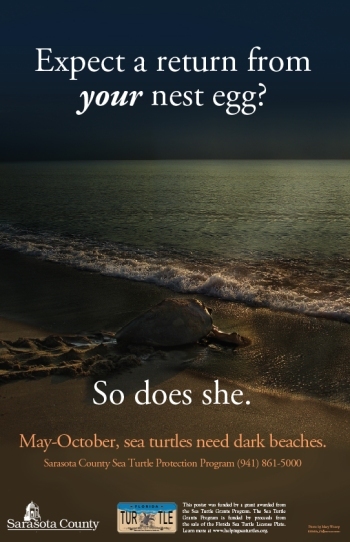 One specific goal of the project is to raise awareness of the impacts of interior light on our nesting beaches. In 2006, interior light sources were documented as a probable or possible cause in 47% of hatchling disorientations in Sarasota County. The proposed static cling decals will be designed for placement on windows and doors that are visible from the nesting beach and will be a tool to remind the occupant(s) to turn off unnecessary interior lights and to utilize window treatments when those lights are needed. The poster will be displayed in common areas and community bulletin boards. The decals and posters will compliment seasonal educational materials annually distributed to the properties.